Isn’t it wonderful, how some designs survive practically unchanged for thousands of years, across vast distances of time and space? I still remember the first time I saw the ‘Huldremose woman’, and Iron Age bog body, in the Danish National Museum. After approximately 2000 years in a bog, the fabric of her plaid skirt still looks like something you might see lining a Burberry coat. Don’t even get me started on belt buckles – that design has changed very little in the last 3000 years. From Roman military buckles, to Ming Dynasty jade buckles, to the gold buckle of Sutton Hoo, to the metal buckle on my leather belt – with slight variations, they are all basically variations on the same design. Today, however, I will not be telling you about plaid skirts or belt buckles, but about the simple but elegant bracteate. While you might not know the word, I’ll wager that you will all look at the picture above, and recognise the artefact: a simple decorated gold disc. Now, bracteates as a type of artefact also goes back thousands of years. The one in the picture above was collected in Qatar in 1959, but similar pendants have been worn, either as necklaces or talismans sown onto clothes, for thousands of years. 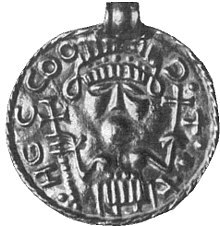 In Europe, bracteates were all the rage during the period known as the Great Migration (or, if you are from southern Europe, by the less flattering term ‘Barbarian Invasions’) which took place during the 4th to 6th century, when great numbers of people migrated south from northern and eastern Europe. These talismans were inscribed with runes signifying their power to protect, or perhaps with the face of the Germanic god Woden. They could also be fashioned out of Roman or Byzantine coins, attesting to the strong strands of trade spanning the corners of the European continent, two thousand years ago. This bracteate was found in Welschingen, Germany, and is thought to depict the Germanic goddess, who was the origin of the Norse goddesses Freya and Frigg. 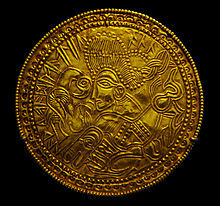 This bracteate depicts the god Odin. It was found on the island of Funen, Denmark, and is now in the National Museum of Denmark. In the Arab world, there are examples of bracteates dating even further back, to the Achaemenid Empire, or the First Persian Empire (c. 550–330 BC). In these finds, the discs were intended to be sown onto a person’s clothes, and among other things featured mythical beasts, and the Egyptian god Bes. The bracteate above is, of course, much more recent, and is, according to the collector, anthropologist Klaus Ferdinand, of a typically Islamic motive. Unfortunately, I do not know what it signifies, but as it is 24 carat gold, it is without a doubt a valuable trinket. Now, I am not stating that all belt buckles, plaid fabrics, or bracteates share a common ancestor. More likely, they are examples of a kind of parallel evolution, where these simple designs crop up independently of each other, because they are the most likely solution. But still, I enjoy seeing these examples of timeless design; of the fact that we have got some things right early on, and do, in fact, not need to change much about it. Because why change something that has worked perfectly well for thousands of years?